Bill Gates has suggested that Donald Trump could spur innovation in the U.S. much like John F. Kennedy did in the 1960s. During a Tuesday appearance on CNBC's 'Squawk Box,' the Microsoft co-founder was asked about a recent phone call with the president-elect. Gates responded by saying, "I had an opportunity to talk to him about innovation. You know, a lot of his message has been about...where he sees things not as good as he'd like." Microsoft co-founder Bill Gates and his girlfriend Jill Bonnett. Microsoft president Bill Gates demonstrates Microsoft's Windows 95 program from his automobile prior to a press conference in Paris 04 September. Gates was also to meet 500 top computer executives as part of his campaign to launch the company's new software. Microsoft Chairman Bill Gates visits an expo previewing Windows XP October 24, 2001 in New York City. The Windows XP operating system goes on sale worldwide October 25. Microsoft chairman Bill Gates testifies at Senate Judiciary Committee hearing into whether the Microsoft computer empire is a monopoly that buries the competition. Bill Gates holds baby girl Cecil Massango during his visit to the Manhica Health Research Centre in Mozambique September 21, 2003. The Bill and Melinda Gates Foundation announced three grants totalling 168 million dollars to fight malaria, a disease that due to increased drug resistance, is on the rise in Africa for the first time in 20 years, killing more than one million people annually. Bill Gates, Chairman and Chief Software Architect at Microsoft, talks to reporters as Microsoft announced the general availability of the new Microsoft Office System, October 21, 2003 in New York City. "The new Office System is a major leap forward for information workers," said Gates, "It makes information work more productive and more profitable by offering innovative new ways to communicate, to find and share information, and to manage complex projects." Former US President Bill Clinton, left, speaks as Bill Gates, chairman, Microsoft Corp. looks on during a session on the G-8 and Africa during the World Economic Forum in Davos, Switzerland on January 27, 2005. Microsoft Chairman Bill Gates delivers the keynote speech at the fourteenth RSA conference at the Moscone Center February 15, 2005 in San Francisco, California. Gates spoke about internet security and new technology that can recognize spyware that might infiltrate a computer. Swatch CEO Nick Hayek and Microsoft CEO Bill Gates attend a press conference for the launch of the new Swatch line 'Paparazzi' by Swatch and Microsoft on October 20, 2004 in New York City. Microsoft chairman and chief software architect Bill Gates smiles during a news conference in Madrid November 19, 2004. Gates signed a technology agreement with the Madrid regional government. Microsoft Corp. Chairman Bill Gates (L) shakes hands with singer Justin Timberlake during his keynote address at the Consumer Electronics Show in Las Vegas January 4, 2006. Gates took the wraps off its next-generation operating system known as Windows Vista on Wednesday, displaying features aimed at positioning the software giant as the entertainment hub for a future of digitally connected homes. Bill Gates attends the Director's Brunch during the 2010 Sundance Film Festival a Sundance Resort on January 23, 2010 in Park City, Utah. Microsoft Corp co-founder Bill Gates (L) interacts with a villager in Aulali village, in Khagaria district of the eastern Indian state of Bihar, May 12, 2010. Gates is on a day-long visit to the state. Bill Gates, the coo-founder and former chief executive of Microsoft, celebrates his 60th birthday. He was born on October 28, 1955. --- In photo: Bill Gates during a press conference in Berlin, on January 29, 2013. Microsoft founder Bill Gates makes a speech after receiving the Millennium Bambi during the Bambi 2013 media awards ceremony in Berlin November 14, 2013. The annual Bambi awards honours celebrities from the world of entertainment, literature, sports and politics. Billionaire philanthropist and Microsoft's co-founder Bill Gates delivers the 14th Nelson Mandela Annual Lecture on the eve of Mandela Day under the theme "Living Together" in his lecture at the University of Pretoria, South Africa, July 17, 2016. Bill Gates, the co-Founder of the Microsoft company and co-Founder of the Bill and Melinda Gates Foundation makes a statement after his meeting with French President Francois Hollande at the Elysee Presidential Palace on June 27, 2016 in Paris, France. Bill Gates mentioned in a short statement after his meeting with French President Francois Hollande that France was a great asset in the fight against AIDS. Billionaire Bill Gates, co-founder of the Bill & Melinda Gates Foundation, center, arrives at Trump Tower in New York, U.S., on Tuesday, Dec. 13, 2016. Exxon Mobil Corp. Chief Executive Officer Rex Tillerson will be nominated as President-elect Donald Trump's secretary of state, setting up a potential confirmation battle with U.S. lawmakers who have questioned the oilman's relationship with Russian President Vladimir Putin. U.S. President Barack Obama (R) presents the Presidential Medal of Freedom to Melinda and Bill Gates during a ceremony in the White House East Room in Washington, U.S., November 22, 2016. Chairman and Chief Software Architect for Microsoft Corporation Bill Gates delivers the opening keynote address for the 2006 International Consumer Electronics Show (CES) at the Las Vegas Hilton. Gates provided an overview of the latest devices and outlined the company's vision for the future by previewing upcoming products like Windows Vista. Microsoft Chairman Bill Gates (R) talks with Sen. Bernard Sanders (I-VT) (L) after testifying before the Senate Health, Education, Labor and Pensions Committee March 7, 2007 in Washington, DC. Gates called for more government spending in education and training, especially in high school math and science. He called high schools in their current form a barrier to success in the digital age. United States President George W. Bush, First Lady Laura Bush and daughter Barbara Bush and former Microsoft Chairman Bill Gates attend the National Aquatics Center on Day 3 of the Beijing 2008 Olympic Games on August 11, 2008 in Beijing, China. Warren Buffett, Bill Gates and Ludacris watch the USA Basketball Men's Senior National Team play against the Canadian National Team during the State Farm USA Basketball Challenge on July 25, 2008 at the Thomas and Mack Center in Las Vegas, Nevada. Bill Gates, Chairman of Microsoft speaks in Hong Kong on August 12, 2008. Gates was giving a speech at Microsoft Research Asia 10th Anniversary Innovation Forum. Bill Gates and director Pablo Larcuen attend the Director's Brunch during the 2010 Sundance Film Festival a Sundance Resort on January 23, 2010 in Park City, Utah. Bill Gates tours and interacts with students in the engineering lab at Science Leadership Academy (SLA) prior to the 2010 Franklin Institute Awards held at The Franklin Institute on April 29, 2010 in Philadelphia City. Microsoft founder and philanthropist Bill Gates (R) shakes hands with France Finance and Economy Minister Christine Lagarde as he leaves the Elysee Palalce in Paris on April 4, 2011, after a meeting with French President Nicolas Sarkozy. Gates is in visit to France for his foundation's Living Proof Project to highlight successes of US-funded global health initiatives. Microsoft founder and philanthropist Bill Gates poses on April 4, 2011 in Paris, as part of his campaign 'Living Proof' for the Bill & Melinda Gates foundation. Bill Gates founder of Microsoft and Bono, singer of U2 meet with President Francois Hollande of France at the Elys Palace to discuss humanitarian projects to fight poverty around the world and support economic development in poor countries. French President Francois Hollande (R) welcomes Bill Gates, the co-Founder of the Microsoft company and co-Founder of the Bill and Melinda Gates Fondation, at the Elysee Presidential Palace, in Paris, France, on April 1, 2014. Bill Gates, founder of Microsoft and co-chairman of the Bill and Melinda Gates Foundation, addresses the National Board for Professional Teaching Standards' inaugural Teaching and Learning Conference in Washington,DC on March 14, 2014. Lin Manuel Miranda and Bill Gates pose backstage at the hit musical 'Hamilton' on Broadway at The Richard Rogers Theater on October 11, 2015 in New York City. Bill Gates, the co-Founder of the Microsoft company and co-Founder of the Bill and Melinda Gates Foundation visits and speaks at the Solidays festival on June 26, 2015 in Paris, France. Bill Gates visited the 17th edition of the Solidays music festival, dedicated to the fight against AIDS. Bill Gates attends the official opening of the Barberini Museum on January 20, 2017 in Potsdam, Germany. The Barberini, patronized by billionaire Hasso Plattner, features works by Monet, Renoir and Caillebotte among others. Bill Gates, billionaire and co-chair of the Bill and Melinda Gates Foundation, gestures as he speaks during a Bloomberg Television interview during the World Economic Forum (WEF) in Davos, Switzerland, on Wednesday, Jan. 18, 2017. World leaders, influential executives, bankers and policy makers attend the 47th annual meeting of the World Economic Forum in Davos from Jan. 17 - 20. He then said, "But in the same way President Kennedy talked about the space mission and got the country behind that, I think whether it's education or stopping epidemics...[or] in this energy space, there can be a very upbeat message that [Trump's] administration [is] going to organize things, get rid of regulatory barriers, and have American leadership through innovation." Gates further noted, "Of course, my whole career has been along those lines. And he was interested in listening to that. And I'm sure there will be further conversation." 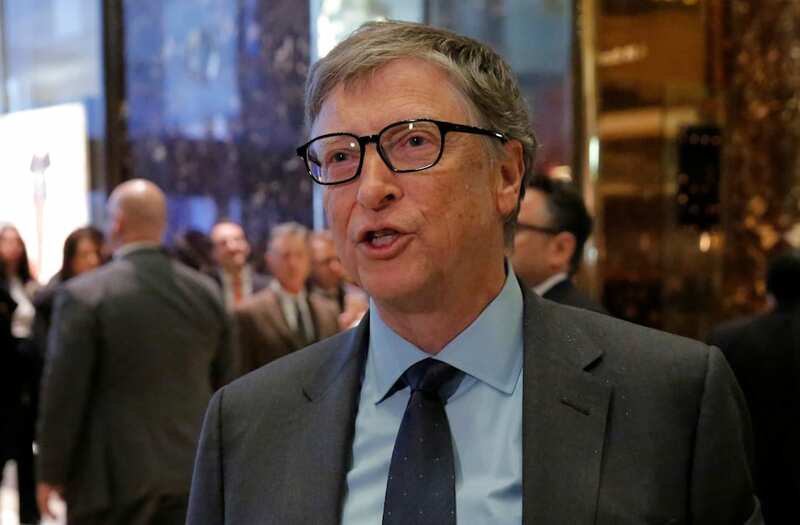 According to Bloomberg, the approximately eight-minute call is believed to have occurred about two weeks ago and involved Gates sharing his thoughts on transforming energy, education, and medicine. During the presidential race, the tech entrepreneur reportedly refrained from openly endorsing Trump or Hillary Clinton but, instead, expressed an openness to working with either candidate's administration.